When you’re nearing the end of a Whole30, the last thing you want to do is cook. You’ll probably find yourself grabbing hard boiled eggs and Lara bars instead of meals. 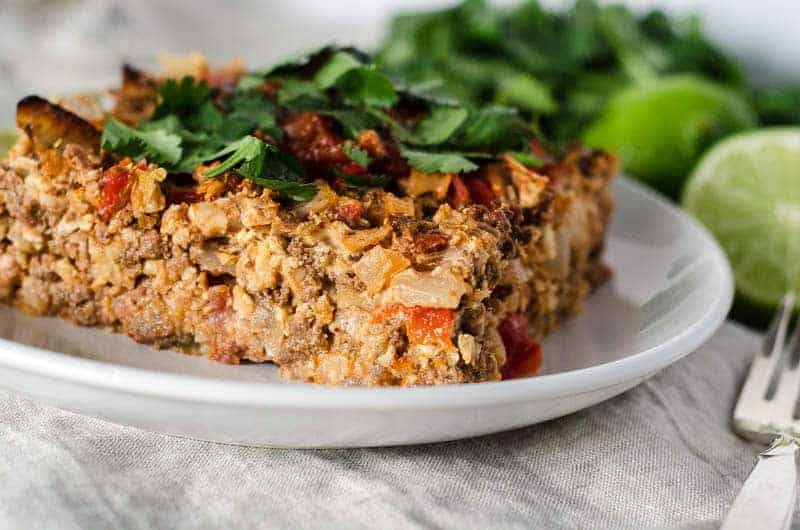 But this taco casserole is here to make your life easier. Sometimes I rice my own cauliflower, because I’m also cheap, but there’s something to be said for paying someone else to do the prep once in awhile. 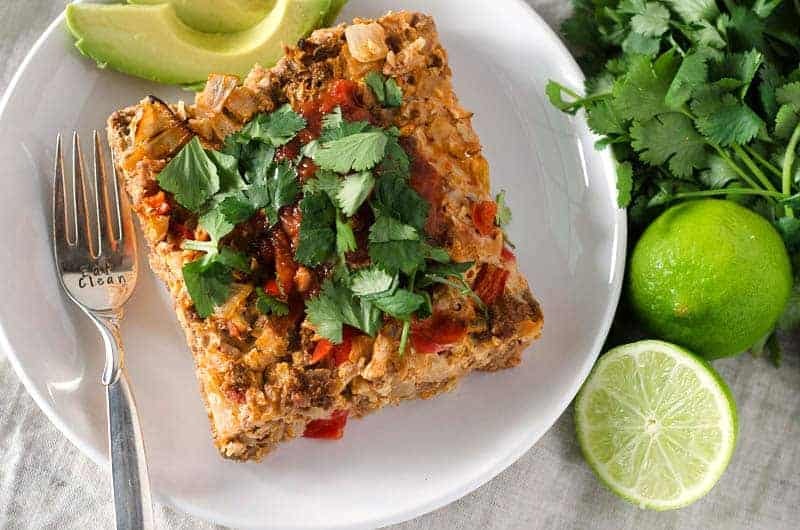 I wanted to make this taco casserole as quick and easy as possible, but also flavorful and satisfying. I’ve had a few other similar style casseroles, and the flavor just wasn’t there – you had to add a bunch of things to make it taste like anything. 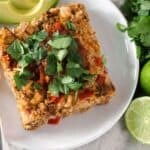 Toppings like cilantro, avocado, and a squeeze of lime juice definitely brighten this one up, but if you’re in a hurry or just feeling lazy, it’s still flavorful all on its own. Disclaimer: you do have to season your beef to turn it into taco meat first. I usually hate recipes that require you to go make another recipe before you can continue. Have you ever read The Joy of Cooking? They’re like, “ok, first, to make this dish, get out all these ingredients. Then, turn to page 42 and make the sauce. You turn to page 42 for the sauce recipe, only to find that it’s directing you to page 137 to make the seasoning mixture for the sauce. Soon you’re eight recipes away from where you started and can’t remember what the hell you were making in the first place. This isn’t one of those recipes. You just need taco meat. That’s it. Here’s a little hack – I often will season meat right after I buy it before I freeze it. You can season and freeze it raw, or season it, cook it, and freeze it. But it’s so nice to go in the freezer and grab a pound of taco meat instead of a pound of ground beef. Meal prep at it’s finest! Moving on. Taco casserole. Taco meat, veggies, salsa, chiles, and a few eggs to hold it all together. 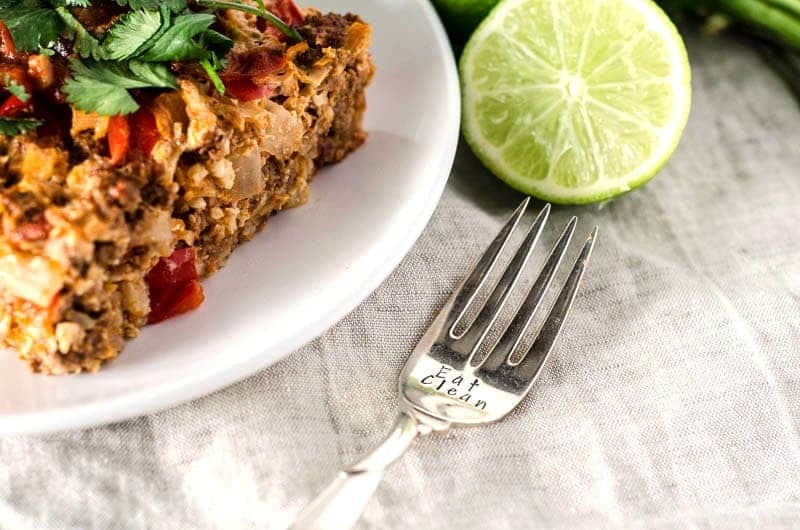 Easy peasy taco pie, made with the laziest of Whole30ers in mind. Enjoy! PS – Can we just talk about my feelings for this fork? I feel more strongly about it than I have ever felt towards any silverware in the past. It was a Christmas gift from my sister and I heart it. (She also got me a Paleo Scaleo spoon, which you can check out over in my Tomato Basil Soup recipe!) I want all my silverware to say something now. Think of all the motivational messages you could read while eating! If your fork could say something, what would it say? Leave it in the comments for us all to enjoy! A quick and easy taco casserole. 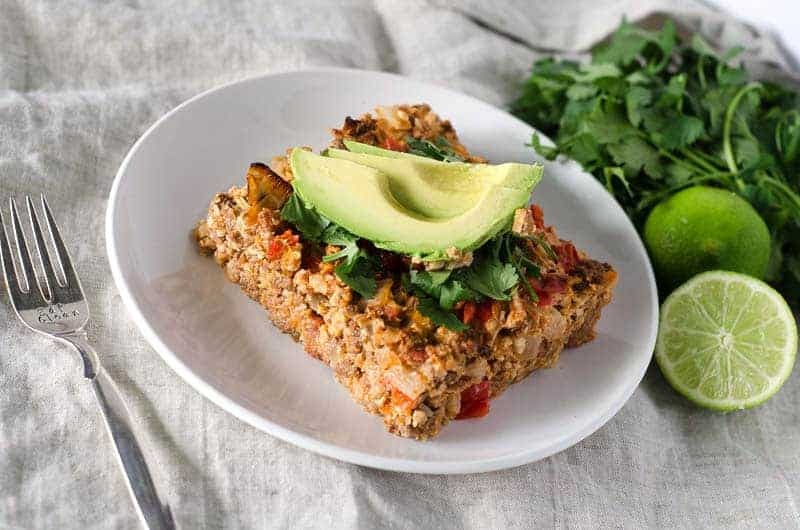 Grain free, delicious, and perfect for your next Whole30! 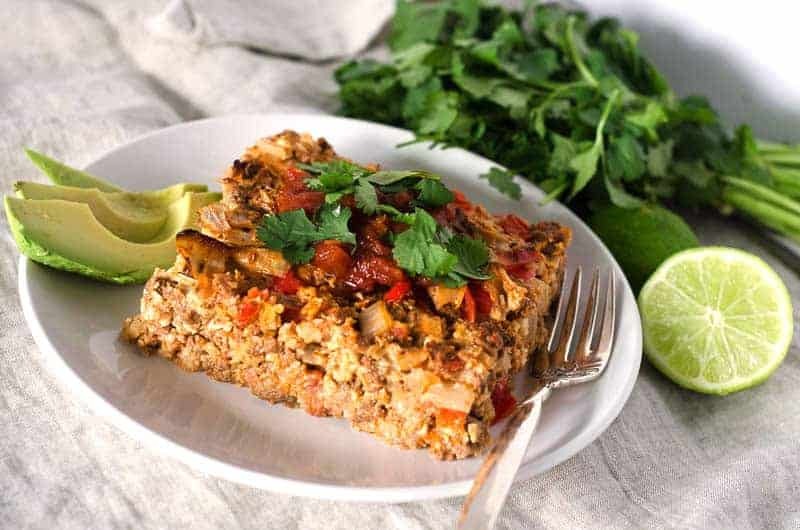 Place your cauliflower rice in a 9x13 baking dish. No need to pre-cook! Heat your coconut oil in a pan over medium high heat and add the onion and bell pepper. Cook 5-7 minutes or until tender. Remove from heat and add to the baking dish with the cauliflower rice. Return pan to the stovetop and cook your taco meat until cooked through. Add to the baking dish. In a small bowl, whisk the eggs until smooth. Add the salsa, chiles, lime zest and lime juice to the eggs and stir. Pour the egg and salsa mixture into the baking dish and stir to combine. Try to get everything coated in the sauce! Bake for 35-45 minutes or until eggs are set and edges begin to brown. Serve topped with your favorite taco toppings - my favorites are cilantro, avocado, and lime juice! My silverware would say “savor”. Love that! Such a good reminder to enjoy what you eat. This is my first time visiting your blog and I have to say I REALLY enjoyed reading about this recipe. Your writing style is so breezy and flows so well. I especially love the part about the fork and that you “heart” it and that it’s from your sister. So sweet. I have two sisters and I just adore them to pieces and I can tell you feel the same about yours as well. Thanks, Ginger! Let me know how you like it! Hi Kim! I typically use a 12-oz jar of salsa for this recipe. Hope that helps! I made this last night and it was GREAT!! I will definitely be making again!! I used an entire large jar of salsa and an entire head of cauliflower. So glad you loved it! I love how easy it is to make. 🙂 Ninja is the best! Can you use frozen riced cauliflower with this instead? Hi Heather! I haven’t tried it with frozen cauli rice, but I think it should work just fine. I’ve heard from other readers that have subbed frozen cauli rice in the buffalo chicken casserole and not had an issue, so this shouldn’t be any different. If you try it, be sure to let us know how it goes!